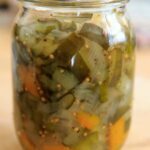 How to make your own homemade sweet pickle relish. After a bit of soaking time you’ll have a super easy, tasty and customizable relish topping for sandwiches, deviled eggs and more! I decided then to make my own, especially after realizing the basic ingredients for sweet relish are simple. Cucumber, bell peppers, onion, salt, sugar, vinegar, spices. Since then, I realized Trader Joe’s has a good organic one as well as I’m sure other natural grocery stores, but if you like the idea of making your own, read on! The great thing about making your own is you can customize. Don’t like red bell pepper? Stick to green. Not sure how you feel about that much onion? Reduce the amount if you’re not as much a fan. You can roughly chop the veggies if you like a chunky relish, or chop more finely if that’s your preference. You get the idea. Red bell peppers are typically on the “dirty dozen” list of foods you should buy organic, so they can be a little more expensive. For some reason I find yellow and orange organic ones easier to find than red, so I used an orange bell pepper for this as well as a green. Besides adding a good pop of color, the sweetness of bell peppers also depends on the color. Green bell peppers are picked before they are ripened, so they have the least flavor and are generally the cheapest. Red are fully ripened, generally the sweetest and also have more nutrients. (But even a green bell pepper has 200% of the DV of Vitamin C.) Yellow and orange are in the middle. Deseed the cucumbers, chop up the veggies and onions, dump salt on top. It is recommended to use kosher salt, which is a large-grain salt, to draw out moisture. I’ve used table salt instead but found the article here to be helpful on describing the differences in salts. Fill bowl with cold water and let soak for a couple hours. Add to: apple cider vinegar, sugar, mustard seed and celery seed. Boil then simmer for 15 minutes. 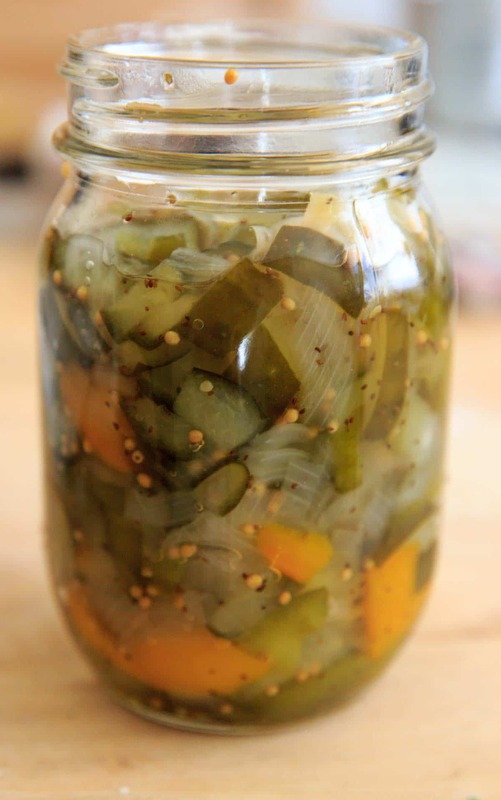 If you’re into canning, you can multiply this recipe and make a big batch for storage. Canning is not something I have experience with, so I made just enough for a one-pint jar. You will have leftover liquids! So while all the ingredients are calculated in the nutrition/calories, not all the sugar and seeds from the brine will actually be consumed. What do you think? 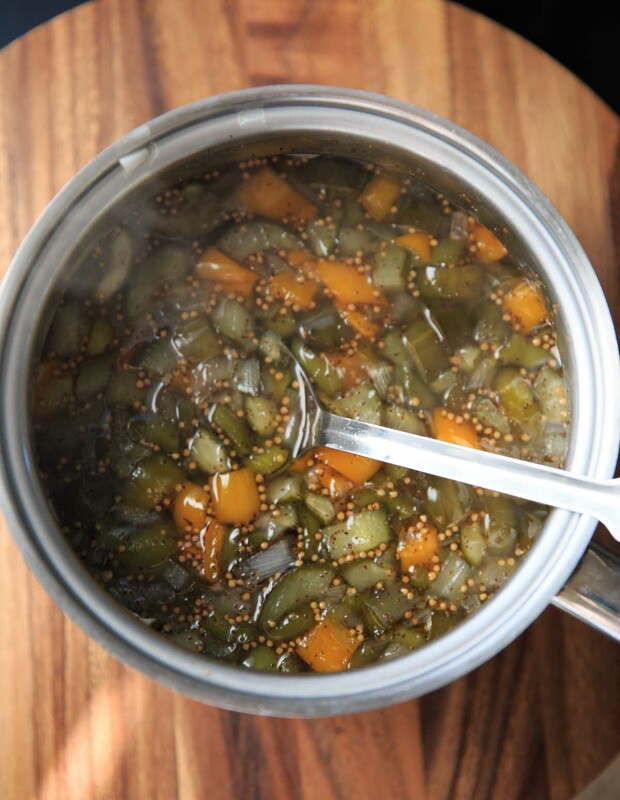 Will you make your own sweet pickle relish? 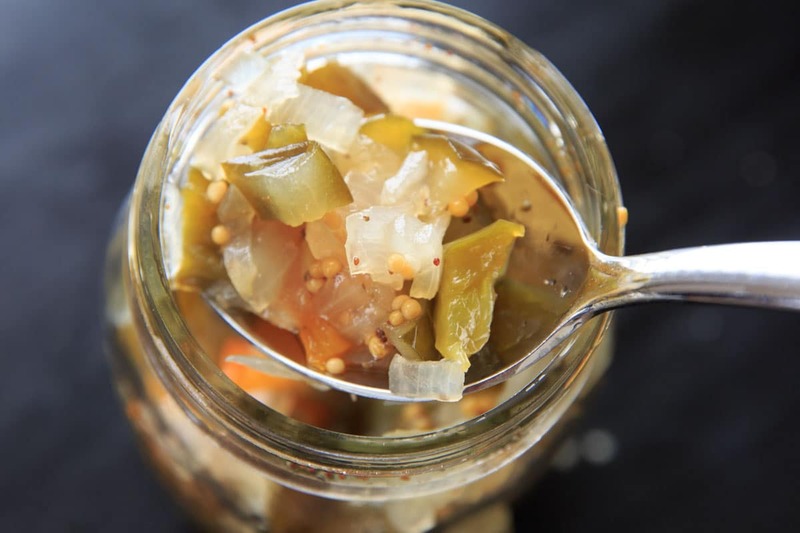 How to make your own homemade sweet pickle relish. With a bit of waiting time you'll have a super easy, tasty and customizable topping for sandwiches, deviled eggs and more! Vegan and gluten-free. In a large bowl, put chopped cucumbers, onion, and bell peppers in and sprinkle salt on top. Cover with cold water and let sit for 2 hours. 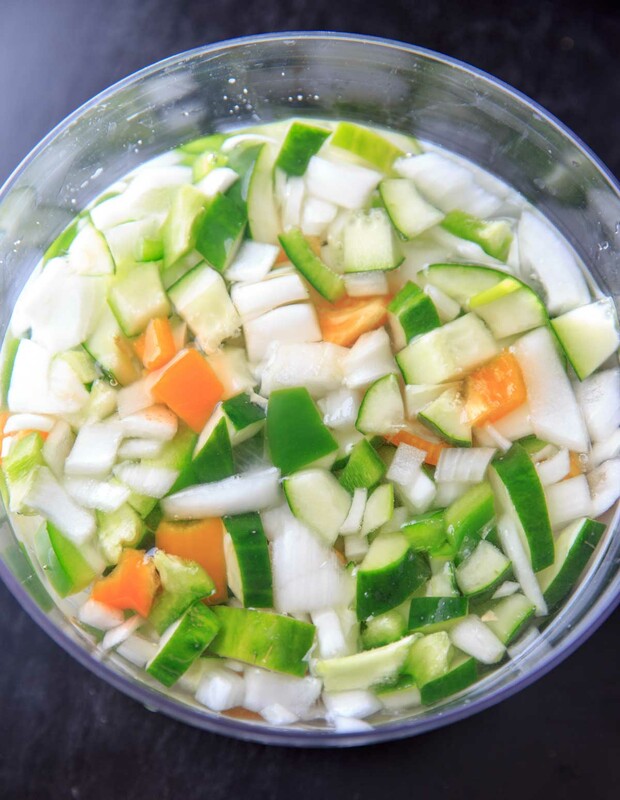 Drain well and squeeze out excess water from vegetables. Set aside. In a large stove pot, add sugar, apple cider vinegar, celery seed and mustard seed over medium-high heat. Bring to a boil. Add vegetables and bring back to a boil. Reduce heat to medium-low, cover and let simmer for 10-15 minutes. Use a slotted spoon to place in pint-sized mason jar (follow proper canning procedures if making in bulk). Add just enough of the liquid (brine) to cover the vegetables but there will be leftover brine. 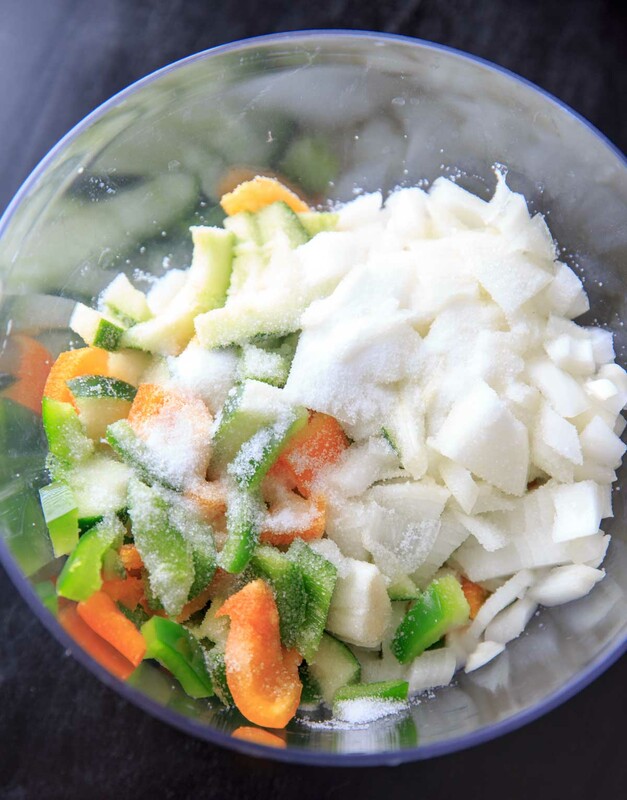 *Pictures are more of a chunky relish, which is achieved by roughly chopping vegetables instead of dicing. *Calories include all of the sugar in the brine, but not all will actually be absorbed by the vegetables. This relish looks so great! I love that it isn’t chopped ridiculously finely like most relishes. Can’t wait to try this one at home. Dill Relish and Sweet Relish are so distinctly different that I usually always keep both in hand! Thank you for sharing!